Kate looks back on her childhood at an important point in her life – she is in her mid-twenties, at the beginning of a promising academic career and in love. She understands that if she continues to keep her man away from her family she will lose him. Contact with her family is diminished after leaving. For years she didn’t have the funds to return home for holidays. But we learn there is a bigger divide – as the only child in academia, she feels a mixture of guilt and embarrassment. She believes that Matt has been robbed of the university career that was rightfully his, and feels embarrassed that she now knows more of the subject he introduced her to as a child. She fears that bringing her boyfriend (who is a professor) to her family home will widen the gap between her past rural family life and promising academic life further. There is a strong family belief in education as the road to leading a fulfilled life and has been the cornerstone of the family’s goals. At the end of the book Marie Pye, her sister in law, has helped Kate to open her eyes to the fact that Matt’s life is fulfilled too and Kate is able to revise her child’s eye version of her family’s history. After the trauma of the sudden loss of her parents, followed by what she sees as Matt’s betrayal of his prospects (and a bit of jealousy for having to share him), and living away from her family for so many years as a young adult, she had not yet been in a position to appreciate the love and commitment of her brothers, who kept the family together under very difficult circumstances. This was the other, equally important cornerstone of her family heritage, and had also been told as part of the family story around the education goal: their father’s older brothers had worked so he could study and once he was earning he supported them when their farms were in trouble. The story of the family and life in East Ontario is well told. The description of Kate as a young adult and her dilemma followed by her reviewing her belief system is a bit thin and not helped by the extreme contrast of her life compared to her boyfriend’s. Parallels to Kate’s family life are drawn in the research done by Kate, in which she reduces the surface tension of the water a pond skater inhabits, to examine to what level and for how long it can stay. A student giving up her course because she is afraid she is becoming too different from her rural family provides a contrast. Another contrast is provided by Kate’s boyfriend, who seems considerate and balanced despite having had a childhood with very little emotional input by his parents, in privileged circumstances which were the reverse of Kate’s. Pembroke Library has two book clubs that each meet once a month. Are you interested in joining a Book Club? We have plenty of options for book lovers to get together and talk about books in Dublin City Public Libraries! 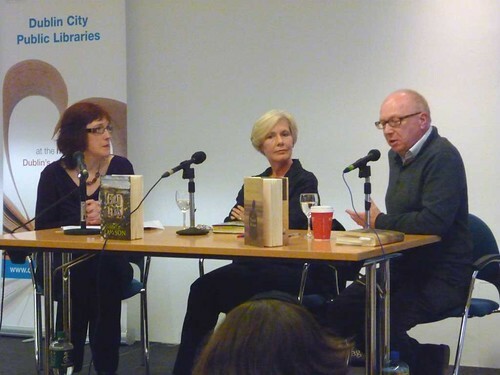 Writers Mary Lawson (middle) and David Parks (right) in conversation with Vanessa O'Loughlin at Dublin Writers' Festival Event, Pearse Street Library on Tuesday 20 May 2014. See more photos of this event on flickr.